If your office mates still don't get the hint with the On/Off coffe mug, switch to this combat mug instead. 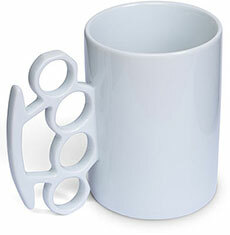 This 20 ounce ceramic Melee Mug ($16) is designed with a handle shaped like a set of brass-knuckles. Though not intended for use as a weapon it may still prove useful when someone tries to approach you for the TPS report first thing in the morning.